Let’s face it; there is nothing physical that we can give that even comes close to what our mums deserve. Without getting all soppy, let’s think about everything our mother’s give us, and do for us – the list is endless. I believe we should spoil our mums all year round, but Mother’s Day is the perfect time to treat your mum to something even more special – pamper them, and show them how much you appreciate every little thing they’ve done for you. This gift guide therefore is a little more luxurious than ones I have done in the past – because mums deserve nothing but the best on Mother’s Day! Firstly, the gift that I have given my mum for probably the last five years in a row, and this year will be no different; a set from Molton Brown. This year, a new fragrance has been launched and it is the Dewy Lily of the Valley and Star Anise range. The bath & shower gel are my particular favourites – hydrating and luxurious with a fresh and light fragrance, a perfect treat for making evening pamper routines that little bit more luxurious. Skincare is an area that I firmly believe in investing in, so treating mum to some cult products will be a treat that she will enjoy for months to come. Something that mum and I both love is the Estee Lauder Advanced Night Repair. If you feel a little tongue-in-cheek buying ‘anti-aging’ products as a gift, then you needn’t worry with Advanced Night Repair. It works to add radiance and reveals smoother skin to all skin types, but also addresses the signs of ageing, without it being the key selling point. Another subtle anti-aging product is Charlotte Tilbury’s Magic Eye Rescue cream. With a focus on reinvigorating the eye area, this rich but delicate cream gives the care and attention that thinner skin around the eyes needs; with anti-aging properties as well as reducing puffiness, smoothing and refreshing. There’s few things more indulgent than a luxurious body lotion, and mum will absolutely love applying a rich, scented cream in the evenings such as Aerin’s Rose de Grasse. The scent is unlike anything else; a timeless rose fragrance which is beautifully delicate and feminine, and the luxurious lotion allows the scent to linger on the skin hours after application. For mums who love rose scents, The Body Shop’s new collection will be the most perfect gift, in particular their Petal Soft hand cream. A lightweight cream which sinks in within a few moments, the delicate fragrance can be detected all day long. It’s also a steal at just £4, but just as luxurious as pricier gifts. Upgrade mums daily beauty routine with a luxury eye cleanser from Guerlain; the Beauté des Yeux is a comforting and refreshing cleanser which also strengthens the lashes while removing all traces of makeup. This is something mum may not splash out on for herself, but a lovely addition to her beauty rituals. Scented candles are a beautiful touch to any home, and Neom is my go-to brand for heavenly fragrances at an affordable price tag. Mum and I both love the Happiness scent; a fresh spring garden aroma in a stunning frosted white encasement. With sustainable wax, made from a blend of biodegradable Soy, Rapeseed, Caster and Beeswax this aromatic candle is also topped up with essential oils which create a blissful atmosphere in any room. The three wick version is the most opulent of the bunch, and still under £50. Choosing a fragrance can be challenging as it’s a very personal choice, but these two scents are the most beautiful of the bunch. Firstly, Viktor & Rolf’s Flowerbomb. My favourite scent of all time and one which Mum loves too; a feminine floral without being too sweet, it’s warm and comforting and instantly loveable. As an extra special touch this Mother’s Day, bottles of the fragrance can be hand painted with a beautiful floral design, exclusively at Selfridges. Of course florals aren’t every mum’s cup of tea, and in this case the Jo Malone Wood Sage & Sea Salt scent will summon thoughts of fresh salty air, a windswept shore and woody earthiness of the sage scent. Another fragrance which is impossible not to love, and beautifully presented in Jo Malone London’s iconic box, tied delicately with the beautiful black ribbon. Finally, a most personal gift is a piece of beautiful jewellery. It can be challenging to find an elegant and timeless piece that is of exceptional quality, and doesn’t cost the earth, but two of my favourite accessory brands have some stunning options for Mother’s Day. Firstly, Carat London have a fabulous selection of affordable yet luxurious accessories (bracelets are from around £180); with modern takes on classic designs. The bracelets in my images feature brilliant cut stones which catch the light in the most elegant way, and have adjustable chains for a comfortable fit with no need to take to a jewellery to adjust. As well as Rose Gold, Carat have white gold, sterling silver and more. Treating mum to a new watch is a beautiful idea, and Abbott Lyon have the most gorgeous range in their new collection, including this delicate Rose Gold chain watch with intricate Swarovski crystals in the face. It’s elegant and delicate; perfect for day time and evenings and a style which will remain timeless for years to come. Keep an eye on my Instagram for a discount code entitling you to a percentage off your purchase. Or why not add a touch of Rose Gold to mums beauty routine? 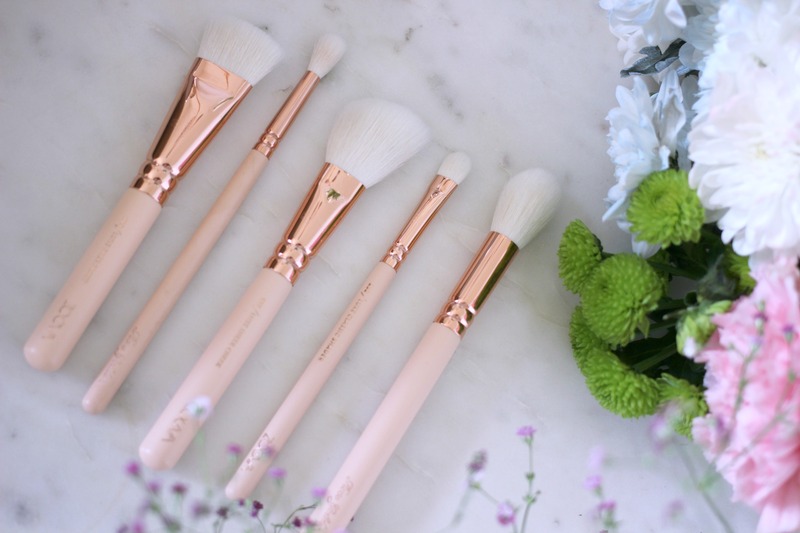 Us beauty bloggers are totally obsessed with the Zoeva Rose Golden brushes, how could we not be?! They’re beautiful! But what about gifting a set to mum? They’re the most gorgeous brushes that you can buy and will make a thoughtful gift to any mum who loves to apply daily makeup. They’re easy to look after, long lasting and make makeup application an absolute pleasure – plus, they’ll look absolutely gorgeous on her dressing table too. A set is the best value for money, or you can pick and choose the brushes that she will use the most to give her a bespoke brush set that she will cherish. Whether mum is a pro baker and would enjoy picking up tips and tricks from the icing experts behind all of our favourite iced biscuits, or is a novice wanting to learn the basics, an afternoon spent at Biscuiteers is a wonderfully enjoyable way to spend time together. While you and mum sip tea and have a lovely catch up, the icing experts will show you different techniques and tricks to create the most beautiful designs on their delicious biscuits. Classes last a couple of hours and can be done at either the Northcotte Road or Notting Hill boutique. After the class you’ll leave with a tasty tin of your very own designs – and trust me when I say that even someone has un-skilled as myself can walk out with a selection of beautifully decorated biscuits to be proud of! There are so many options out there when it comes to facials, it’s so hard to know which to treat mum to without having a personal recommendation. Well, I personally recommend the facials at the Aveda salon in the heart of London – within their spa, an ambient oasis under the bustling streets above. The treatments use plant-based rituals that the brand is so well loved for, and facials begin with an invigorating foot scrub before you slip into the heated bed. The facials can be customised depending on your skins needs, but which ever option you go for you’re sure to step out feeling utterly relaxed and invigorated; you’ll be pampered and massaged using the ayurvedic essential oils – just try not to do what I did and become so relaxed that you fall asleep! What better thing to treat mum to than an hour or so of total bliss. Will you be treating your mum to any of these little luxuries on Sunday?